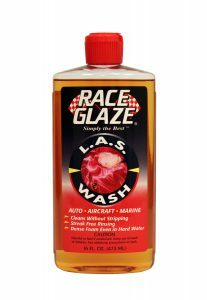 Race Glaze L.A.S. (Land, Air, Sea) Wash is simply the finest vehicle wash available anywhere at any price. This Hyper concentrate is very economical to use for washing autos, trucks, aircraft and boats. It performs with rich, dense suds – even in hard water. Concentrated - 1 cap per 2 gallons of water. Dense foam even in hard water. Floats away soils, abrasives. Blend of nonionic and anionic surfactants to gently and thoroughly clean. Does not contain APEOs (Alkylphenol ethoxylates). Use one capful for every 2 gallons of water. For body shop use, L.A.S. Wash added to sanding water will prevent buildup and loading on sandpaper.